I don’t know when I learned how to use mind-maps — also called clusters or webs — but I use them regularly in preparing for writing projects. I think they are fun, but more than that, I find them useful. 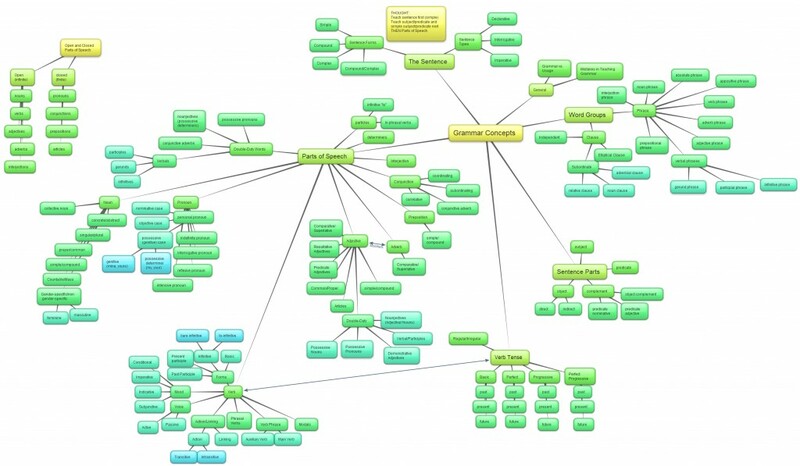 A mind-map is a way of recording and ultimately organizing ideas. It is a useful pre-writing tool. Unlike simple brainstorming lists, clusters visually indicate how ideas relate to one another. This is more elaborate than most mind-maps need to be, but it’s a good visual example. Mind-maps start with the core concept in the center — in this case Grammar Concepts. That’s when free-association begins. I think I started with parts of speech next, which I connected by a line to the center. Then I wrote the various parts of speech — noun, pronoun, verb, etc. — and connected them to the parts of speech hub. Then I went back to the center and wrote sentence parts, connecting it to grammar concepts. You get the idea. Mind-maps work like my brain works — in meandering paths of connected thought. It’s a kind of organized chaos that suits the way I tend to think. This map took me hours over several sessions. I reworked some things and reorganized some things. And I’m not finished yet. Mind maps always seem to be works in progress. You might be wondering about the value of all this. It’s my way of getting as many of my ideas on paper as possible before I begin writing. Clustering allows me to get it all down in a visually understandable way. I like to use colors and text sizes to help with the visual element. More artistic people include sketches, images, and illustrations. I have an artist friend who would take notes during Sunday morning sermons this way using colored pencils. His notes were as beautiful and interesting as they were informative. But you don’t need artistic skill to make use of mind-maps. For me, mind-maps are followed by a traditional linear outline. It’s easy to make the conversion. Groups and subgroups have already been created. The only decisions to make now involve priority and order sequence. Now that I’ve imposed some order onto my thoughts, I’m ready to start writing. This kind of pre-writing exercise is particularly well-suited for informational texts like a grammar curriculum, but it can also work for essays, research papers, even novels. Anytime you need to corral a scattered mess of ideas, give mind-mapping a try. All you need is paper and pencil, but I’ve had particular success using colored markers on a dry-erase board. I’ve also used a combination of markers and sticky-notes. There are also an amazing number of web tools and apps that are designed to create mind-maps. Some are costly, downloadable programs. Others are free. Personally, I like the free ones. The map above was created with a free online program called Bubbl.us. I’ve also used SpiderScribe. Both are free, easy to use, and allow you to save, download and share your maps. 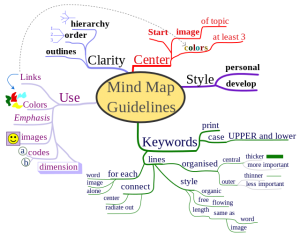 Here are just a few of the free mind-mapping tools available online. Check them out. There are even more available exclusively for tablets and smart phones. Whether you use one of these tools or simple paper and pen, I urge you to give mind-mapping a try. Bloggers love comments. Please leave yours in the space below! Thank you ~ this was a great explanation! I wish I’d learned mind mapping when I was in school (“way back when” in the dark ages 😉 ). I don’t often comment on blogs, but I’ve a few minutes this morning, so here goes. I didn’t find out about Write At Home until after our third had graduated (2003), but our youngest three kiddos all went through at least 5 years of your programs and it made an incredible difference. Not only did the two youngest boys learn that they could write, but they actually found out they *liked* it! 😉 And our youngest girl, who always enjoyed writing, did well with Write At Home. Wow. Thanks, Kay. Your note made my day! Mind if I share it on Facebook?